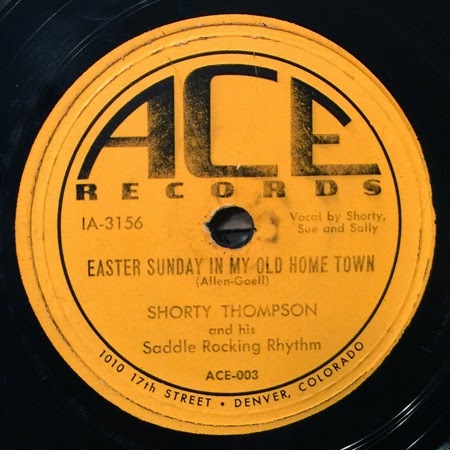 Found this holiday appropriate 78rpm - the second Shorty Thompson disc on the Ace label in my collection (also have Ace 001 "Colorado Rose" / "Baby I've Got the Goods on You"). Maybe 002 will turn up, someday. There's already a ton of bio info about Shorty on the Internet, so I won't copy and paste here (I mention a bit about him in a past blog post on Dave Spielman and his Rhythm Rangers). That said, I can't find ANY information on this release. Every discography I have found on Shorty fails to mention this record. Can't imagine stumbling upon a rarity here, but who knows.